All Saints is located in south Dorchester, just off Peabody Square, at 209 Ashmont St. and is a short walk from the Ashmont T station on the Red Line. There is a private parking lot for more than 50 cars and on-street parking on both Ashmont Street and Lombard Street, behind the church. 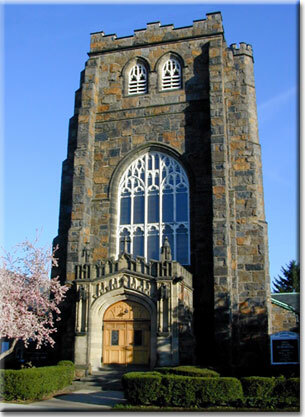 All Saints Church and Lower Peabody Hall are wheelchair accessible. By car from the North, exit from I-93/ Southest Expressway at Exit 11B, Ashmont /Granite Ave. From the South, take exit 11, Granite Ave. From either exit you will be heading north on Granite Ave.
Cross over the small bridge spanning the Neponset River. Stay in the left hand lane and proceed through three traffic lights. The fourth traffic light will be the intersection of Gallivan Boulevard and Granite Ave. From this point north, Granite Avenue becomes Adams Street. Landmarks are: McDonald's on the right; the Eire Pub across the street. Turn left at this intersection onto Gallivan Boulevard. Proceed through the first traffic light and take the second right onto Carruth Street. Proceed to the top of the hill and turn left on Ashmont Street. The entrance to the parking lot is on the left. From the west, take the Riverway, Arborway, and Jamaicaway past Forest Hills, the old Boston State Hospital site to Morton Street. At the Y in the road at the firehouse, bear to the left to Gallivan Boulevard. Turn left at the intersection of Gallivan and Dorchester Avenue. Proceed several blocks until you pass Ashmont T station, turn right onto Ashmont Street. The entrance to the parking lot will be on your right about 100 feet.